Do any of you guys use Pinterest? Have you noticed they broke the feed? I totally get that they needed to add ads, but why the f**k do they have to add a bunch of unsolicited pins from boards I don't follow? I follow over 2500 boards, surely there is content available to show in my feed... I don't see any settings I can change to just see pins from boards I follow, so I assume I'm stuck with this. I used to enjoy poking around Pinterest to find good pins, but now my feed is mostly unusable. Since it's quite easy to go back and look at my own pins, I still pin stuff in order to keep track of sites for future reference, but I honestly don't see the point of browsing anymore since 90% of the feed is stuff I'm not interested in. Have any of you Pinterest users found the same problem? Are the pins in that feed actually useful to you? Update later: Apparently, I'm a little slow on the uptake. I've noticed that my feed was steadily getting worse and worse, but I didn't really realize until today that there was practically nothing in it I wanted to see. Lots of bloggers have talked about the new feed, called the "Smart Feed." I did finally figure out how to get rid of the unpaid pins. If you click in the box next to the user name and board name, an X appears. Click on the X and then select an option from the menu that pops up. I went ahead and told it to stop using my boards for inspiration. It was tedious, because I had to do it for every board, but I did remove the "Picked for you" pins. My feed is still full of a bunch of ads for stuff I have no interest in, but at least I can now see some of the boards I actually do want to follow. I guess Pinterest has done me a favor; I now have very little desire to spend hours browsing their site. Do you guys have any suggestions for what is next? Instagram? I found an browser extension you can install to block the sponsored content. I just tried it and it WORKS! You can download it here for free: pinBlock. While I had almost entirely stopped using Pinterest, I may spend a bit more time there again. I feel the exact same way, and I was complaining about it to a friend the other day. Used to be a chronological feed of new pins from folks that I follow, and now there's almost nothing left of the original interaction between pinners and Boards. You said it well ... Pinterest is broken. I no longer enjoy browsing my feed and seeing what everyone is pinning. 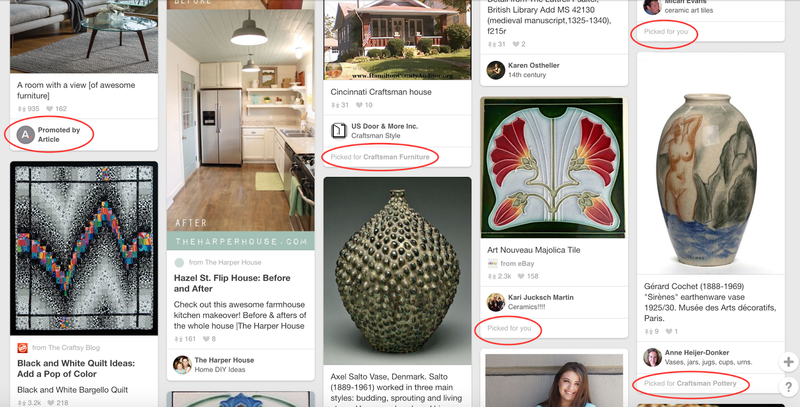 (Looks like Pinterest wants us to do it via the Notifications drop-down in the upper corner. Not gonna do that, thank you very much.) Except for bookmarking stuff I want to save, Pinterest is no longer something that I do much with. Agreed. I use it very little now. I mostly pin stuff because I want to be able to find the links again. And there are way too many ads for stuff I don't want in my feed. If they customized the ads for content related to my interests, I might not mind. But it is totally jarring to see pictures of bikini'd women and ugly modern furniture in my craftsman-related feed. I dislike Pinterest. It is clogging image searching with stuff that has no source. I hate that. I want to know who made things and what else they made. I don't just want a bunch of photos. No kidding. I mostly use it to keep track of websites. And I did get addicted for a time, but I'm so over it. But when I do searches, I don't tend to open the pinterest links unless that's all there is.